I personally love any type of cat art. But cat prints are my favorite. Cats’ beautiful form and mysterious personality make them the perfect subject matter for many print artists. And, you can find a wide selection of cat art prints online. Cat prints are also terrific decorative pieces. Whenever I visit one of my cat lover friends, I tend to gravitate towards her cat-inspired prints, which are artfully displayed around her apartment. These pieces certainly make wonderful pieces of conversation and give a unique touch to her place. Cat lovers who also love and collect art, like my friend, will appreciate a gift of carefully selected cat-inspired art prints. Cat prints also make a wonderful gift for cat lovers in general. Of course, the gift recipient’s taste must be taken into account during the selection process. Does your cat-loving friend like modern art? Or does she favor classical works of art? The good news is that there are many options to choose from. Modern, abstract, traditional… you name it. Since there is such a wide selection of cat art prints and fine art prints available, you will surely find a unique piece that will please and delight your friend. This page gives you several tips to find the right print for you or your friend. Plus, you will find information about print artists who specialize in cats and the art of printmaking. -- Give a whimsical or inspirational cat print. It will certainly lift any cat lover’s spirit! -- Give cat prints of movies: The Aristocats and Puss in Boots come to mind. -- Humorous cat prints: They will put a smile on your friend’s face. -- Give a cat art print reflecting your friend’s taste: fantasy art, realistic, contemporary, vintage, classical, etc. -- Art prints by breed: you can find art prints of almost every cat breed! 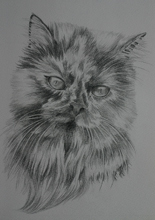 **You can also find cat prints of tabby, calico and tortoiseshell cats. -- Have your print framed! Many online stores offer several framing options. -- Still not sure what to give? A gift certificate makes a great choice. Several trusted online art stores offer this option. During my research on cat art I found several talented and distinguished artists who specialize in cat prints and cat art. Among my favorites are Drew Strouble, Eve Riser-Roberts and Tomoo Inagaki. Eve Riser-Roberts, from The Cat Gallery, is an award-winning artist and is well-known for her imaginative paintings and prints of cats. Her interpretations of famous works of art are very popular. Many of her prints are parodies of well-known paintings, such as Munch’s Cat– which is a parody of Edvard Munch’s The Scream, and Manet’s Cats– which is a parody of Manet’s Olympia. Riser-Roberts received her B.S. and M.S. from the University of Arizona, and her Ph.D. in Microbiology from the University of London. Tomoo Inagaki –born in Tokyo– was an acclaimed Sosaku Hanga artist. The Sosaku Hanga (which means creative prints) is a Japanese print movement that was established in 1918. Inagaki specialized in cat-themed prints and became very popular during the 1950s. Some of his famous cat prints are “Four Sleeping Cats” (c. 1950-1960), “Cat Making Up” (1955), “Black Cat” (c. 1940-1950) and “Couple of Cats” (no date). Inagaki’s designs are modern, simple, and elegant. Mr. Strouble, from CatManDrew.com, is an award-winning artist, well-known for his paintings and prints of cats. Mr. Strouble’s collection of watercolors of domestic cats is the largest in the world by a single artist. He also specializes in cat portraits. Curious about the art of printmaking? Here's some interesting information. A print is a work of art. It is the result of a process called printmaking. Unlike the process of drawing or sculpting (by which artists create a single piece of art), printmaking allows the artist to create multiple pieces of art, which are derived from one original piece. However, each print is considered an original work of art. Prints are created not by directly placing the ink (or whatever type of pigment the artist is using) on the paper but by transferring the design from a single, flat surface, stone or plate onto the paper (usually, a printing press is used during the transfer process). The plate could be made out of metal, wood or linoleum. Impressions made from a single plate are called an edition. There are several printmaking techniques. The most popular techniques are etching, screen-print, woodcut and lithography. Other techniques include: engraving, batik and dry point. With the advent of the computer, printmaking techniques have been influenced by digital methods. Woodcut Artist's Handbook: Techniques and Tools for Relief Printmaking by George A. Walker, Foreword by Barry Moser. Screenprinting: The Complete Water-Based System by Robert Adam, Carol Robertson. Looking for a less expensive gift? -- You can certainly find high quality art prints at affordable prices. If, however, you're on a limited budget, then posters make an excellent and inexpensive alternative! -- A fun cat calendar is another inexpensive gift idea for lovers of cat art. -- Create you're own art. If you have a computer and a program such as Photoshop you can create nice pieces of art using your own cat's pictures.